This is an old post and lot of things have changed since then. An updated version is available here. Its very simple to use the media player to play audio files. All we need to do is to initialize a media player object, set the audio stream, prepare the audio for playback and then finally start the playback. The following snippet demonstrates how to play an audio file obtained from an external url. The media player takes care of streaming the audio automatically. Preapre method prepares the audio for playback and can therefore take a long time. While the audio is preparing, the android's UI might seem to be non-functional and wouldn't respond to user requests. We will therefore use prepareAsync() method which prepares the media player in background on another thread and notifies the onPreparedListener when the prepare method is complete. Another thing that we want our media player to do is allow the user to work on other things while the media is playing in the background. This can be achieved using a background service rather than playing the music in the app's activity. Let's create a new Service by extending the Service class in android and associate build some functions to perform operations on media player. Phew! That's a lot of code. Don't worry. I will break everything down for you. The onCreate method is called whenever a new service is created in android. We want our application to be able to communicate with the activity that builds the UI on android. Therefore, we store the instance of service as a static object in the service itself. Another alternative to this is to bind the service to the activity. But that's a bit complex to achieve and I would skip that for now. Since our service will run in background even when the user has not opened our application, we should therefore notify the user about what the service is doing. We will achieve that through notifications which are displayed in the top bar in android. We register the service as the onPreparedListener for music player so that we may be notified about the state of music player. The most important point with music player is that it has a very complex state diagram and there are several restrictions on which functions can be called in which states. We therefore need to keep track of the state that music player is in. We will use our own enum for that purpose. The onBufferingUpdateListener is used to notify the user about the buffer progress of the song. That almost wraps up the backend that we need to play music. now lets get on to the front end, i.e. our activity that builds the UI. 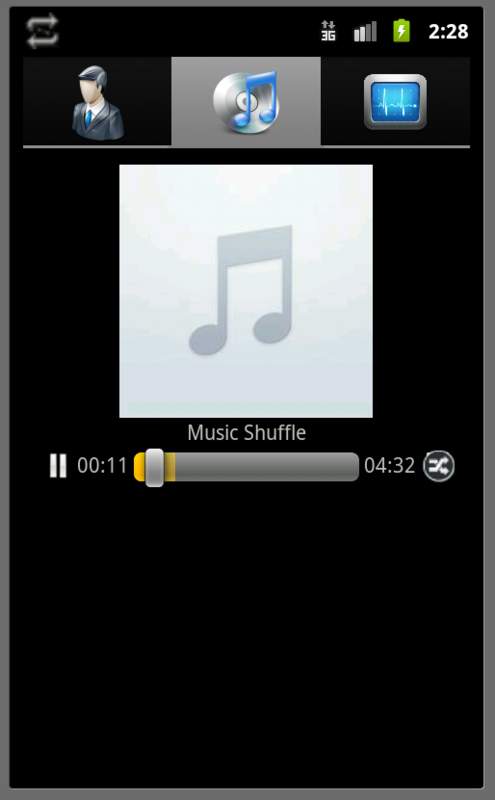 Android does provide an easy way to have media player controls in android using the MediaController class. 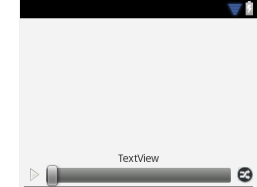 This creates floating controls and takes care of interacting with the media player. However, it doesn't offer any functions to modify the look and feel of the UI. We would therefore use our manually created music player controls for our music player. As with all other activities in android, we would first need to prepare out layout for the activity. Lets call the layout music.xml and add it to res/layout in our project. We would also need to check the status of music every second and update the seek bar manually. To do this, we start a new thread and poll the service for music progress, buffer progress and music duration every second. Notice the runOnUiThread method. This method is necessary to update activity's UI components in a thread-safe way. We have almost everything ready to have our first music player ready. But to play the music, we would need to start the music service.